The planet Jupiter is a gas planet made up of hydrogen and helium. Jupiter is the largest planet in the solar system…it is also the fourth brightest planet as viewed from earth. 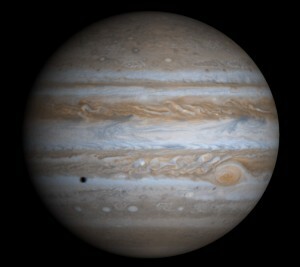 One of the key visible aspects of the planet Jupiter which everyone is most familiar with is it’s great red spot. The spot is actually “The Eye of Jupiter” and is a giant storm on the planet. Also, although it does not appear to have any, this planet does in fact have three rings! There are 63 moons of Jupiter, the most famous of which is Ganymede which also has the distinct honor of being the largest moon in the entire solar system!